Growing your mailing list through your website will allow you to steadily collect opt-ins and grow your list over time. If you want to accelerate your list building efforts, you can make use of some of these alternative strategies that work independently of the traffic that your website normally receives. While sign-ups through your website will happen automatically, the strategies listed below will require either a financial investment or an investment of your time and energy. Don’t let this scare you off. Paid acquisition strategies can be some of the most consistent and profitable ways of making money through email marketing. For example, let’s say that you can make $5.00 from each email sign-up on your mailing list and could pay $2.00 to get someone to sign-up for your mailing list. You would buy as many of those leads as are available because it’s better than any other investment that you can possibly make. If you put $2.00 in the stock market, you’ll be lucky if you get a 10% return on that investment in one year and it turns into $2.20. If you pay $2.00 to acquire an email address and can make $5.00 off it over the course of the following year, that’s a return on investment of 150%. If you have a well-honed conversion funnel, spending money to acquire email sign-ups can be one of the most profitable investments that you can make. Co-registration advertising networks allow you advertise on other websites’ “thank you” pages. After someone signs up for a mailing list on a website that is running a co-registration ad unit, they will be presented a list of offers from third-party advertisers (like you). If the subscriber selects your offer and presses the submit button, the advertising network will provide you the subscriber’s contact information to add to your mailing list through an API call or by periodically sending you a spreadsheet of new sign-ups. You can expect to pay $1.00-$4.00 per sign-up through a co-registration ad-network. The quality of the sign-ups that you receive from co-registration advertising will vary depending on the sites that your ad is running on. When working with a co-registration ad network, I recommend asking for a list of sites that they have available for you to advertise on. Only agree to place your ads on websites that are similar to yours or are in the same industry. Subscribers that come from unrelated websites are less likely to be engaged with your content and will be less likely to purchase anything from you. The quality of leads can also vary among multiple sites in the same industry. One site in your industry may send subscribers that connect well with your content and another may send subscribers that aren’t engaged with your content and are of no value to you. Given the ongoing cost of running a co-registration advertising campaign and the disparity of lead quality on a site-to-site basis, you will want to monitor performance on a per-ad-network and per-website basis every month. Are the subscribers that came from a particular website’s co-registration ad-unit as engaged as users that sign-up through your website? Are they opening emails at the same rate as other subscribers? Are they clicking on links? Are they buying products and services from you at the same rate as other subscribers? While running a co-registration advertising campaign can be incredibly profitable, you must monitor your campaign’s performance regularly to weed out underperforming websites and ad networks. Co-registration advertising is more prominently used in some industries than others. You will frequently see co-registration advertising units on financial websites, sports websites, travel websites, business opportunity websites and disaster preparation websites. While you can run a co-registration advertising campaign for a website in just about any niche, co-registration advertising works better for some industries than others. AfterOffers – After Offers (www.afteroffers.com) works with advertisers and publishers with travel websites, financial websites, internet business websites, and survival/disaster preparation websites. CoregMedia – CoregMedia (coregmedia.com) is a general co-registration advertising network that works with publishers and advertisers in a large number of industries. CoregMedia advertises on its website that it works with many major advertisers like Kohls, Nokia, Gap, Dish Networks, Red Lobster and Wal-Mart. Investing Media Solutions – Investing Media Solutions (www.investingmediasolutions.com) works with advertisers and publishers with financial websites. 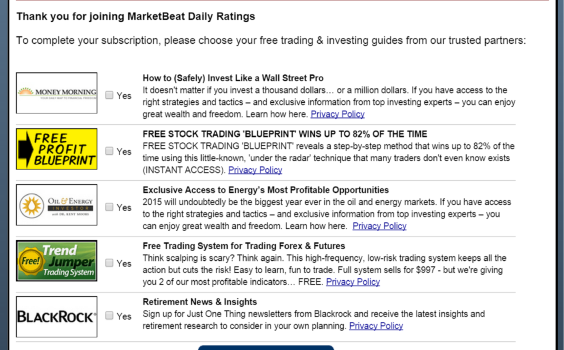 Investing Channel – Investing Channel (investingchannel.com) also works with publishers and advertisers with financial websites. OptIntelligence – OptIntelligence (optintelligence.com) is one of the largest co-registration advertising platforms online. OptIntelligence works with many major advertisers and publishers in a wide variety of industries. Tiburon Media – Tiburon Media (tiburonmedia.com) is a general co-registration advertising network that works with a number of major companies including Microsoft, Adobe, Cisco, Dell, Disney and Toyota. If you have built up a mailing list of a few thousand subscribers, swapping email sends with other mailing list owners can be an extremely effective way to grow your mailing list. When you do an email swap, you will send a marketing email to your subscribers on behalf of another website and they will send an email that you write to their mailing list. The email that you send to your email swap partner’s list should attempt to get their subscribers to sign-up for your mailing list. The email should contain some kind of offer or lead magnet and contain multiple links to a page on your website that contains an opt-in form. If you don’t have a page dedicated to collecting email sign-ups on your website, create a new page that has nothing more than an opt-in form to sign-up for your mailing list. This is called a landing page. Note that you should never send your actual mailing list to your email swap partner and they should never send their actual mailing list to you. Your swap partner will send out your email to their subscribers and you will send out your swap partner’s message to your subscribers. Your mailing list should be treated like classified information. It should never be given to any third party under any circumstances. You don’t know what kind of spam an unscrupulous partner might send to your list, so it’s best to keep your actual mailing list under tight wraps. In order to find email swap partners, make a list of as many websites that you can that are similar to yours. Review your list and remove any websites that do not have opt-in forms on them. It is unlikely that a website has a mailing list if they are not actively soliciting opt-ins. If possible, try to make a list of 100 different websites that you could potentially swap email sends with. Go through your list and send an introduction email to each website’s owner that provides some background information about you and your website. Tell them that you are actively seeking for other websites to do email swaps with. Ask if they have a mailing list and if they would be interested doing a swap with your list. Since email swaps are generally a no-lose proposition for both parties, you will find that many other webmasters are more than happy to do email swaps for you. If you want to streamline the process of finding email swap partners, you can use a service called Safe Swaps (www.safe-swaps.com) to find other webmasters that are interested doing email swaps with other mailing lists owners. Safe Swaps is a paid service that costs $29.95 per month to use. If you have a sizable advertising budget to grow your mailing list, you can pay other mailing list owners to send an email to their list on your behalf. Email list rentals work similar to email swaps. Instead of repaying the other mailing list owner by mailing your list on their behalf, you will pay them a negotiated fee for the privilege of their mailing list. You will create an email that contains an offer for some kind of lead magnet and a link to sign-up for your mailing list. Another mailing list owner will send the email promoting your mailing list to their mailing list on a set date and time for an agreed-upon fee. Email list rentals are typically sold on a cost per thousand (CPM) basis. If you wanted to email 10,000 subscribers on someone else’s mailing list and they charged a $25.00 CPM, you would pay a $250.00 fee. Prices for an email list rental can vary dramatically depending what industry or niche the mailing list is in. For example, mailing an email list of investors will cost much more than emailing a list of computer gamers because selling products to investors is much more profitable than trying to sell products to gamers. For lower end categories of mailing lists, you might be able to rent an email list for $10.00-$20.00 CPM. For high-end categories of mailing lists, you might pay $50.00-$100.00 CPM to email someone else’s list. In the internet marketing space, you might see email list rentals referred to as “solo ads.” In other spaces, you might see email list rentals referred to as “dedicated email sends.” Do not let this throw you off. “Solo ads” and “dedicated email sends” are just another name for email list rentals. There are a number of online databases that advertise email lists that are available for rent. NextMark (www.nextmark.com) is probably the largest online database of email, phone and snail mail mailing lists with more than 60,000 mailing lists available for rental. Unfortunately their search tool is a bit antiquated, so you may have to comb through several pages of results to find a list that you want to email. There is a wide range of quality among email list rental providers. Since you never actually see the list provider’s subscriber list, there is no way to independently verify the size or quality of their mailing list. While many email list rental providers are professional and completely above board, there are some unscrupulous providers that try to pass off compiled lists, purchased lists and unrelated mailing list as a high-quality and relevant list available for rental. Because of the level of trust involved, you should only work with very reputable mailing list owners. If possible, consider working with an agency that works with advertisers in your industry to do email list rentals. 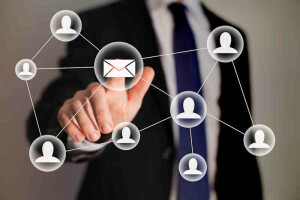 A good email advertising agency will already have relationships with mailing list owners in your industry and can mitigate the possibility of working with dishonest mailing list owners. While renting an email list is a commonly accepted practice in the email marketing industry, buying an email list is not advisable under any circumstances. When you are renting a list, you are paying another mailing list owner to email their list on your behalf. You are effectively borrowing the permission that their subscribers have given the list owner to email them. While there is nothing that’s necessarily illegal or immoral about purchasing a mailing list, buying a mailing list is generally a bad idea because individuals on a purchased list have not opted-in to your mailing list and haven’t given you permission to email them. Using purchased email lists in order to try to get customers usually is not a very effective marketing strategy. Most email lists that are available for sale are low-quality, out-of-date and are not maintained very well. People that are on a purchased lists won’t be engaged with your content and won’t want to receive email from you. More importantly, they are very unlikely to buy anything from you or respond to any of your offers. Many email service providers (ESPs) will not let you use a purchased list with their services because of the damage that mailing a purchased list can do to the reputation of your domain name and IP address. Emailing purchased lists usually results in an unacceptably large number of spam complaints and undeliverable emails. This runs the risk of your domain name and sending IP address being added to a blacklist, which cause your future mailings to end up in subscribers’ spam folders or not be delivered at all. In order to maintain the reputation of your domain name and sending IP address, your best bet is to only email people that have directly given you permission to email them. If you publish an email newsletter, place social media sharing buttons and a “forward to a friend” link in each of your newsletters. These buttons will encourage your current email subscribers to share and forward your email content to their friends and other people in their social networks. By doing this, you’ll gain access to friends and acquaintances of your existing mailing list subscribers that aren’t familiar with your content. You can also consider placing a call-to-action at the bottom of your newsletter with a link to subscribe, which will encourage anyone who received a forwarded copy of your newsletter to sign-up for your mailing list. Most email service providers include tools to make your email content shareable, so you shouldn’t need to do much work to add social sharing and “forward to a friend” links to your emails. Whenever you publish an email newsletter or another piece of informational or educational content, post a copy of that email into an archive of newsletter content on your website. If you’re using WordPress, this might mean that you create a new category for newsletter content and publish any new newsletter content as a post in that category. Whenever you add a new email newsletter to the archive, share it on all of your available social media channels. This will broaden the reach of your email content and will make it visible to your followers that aren’t on your email list. It will also provide a second way for your subscribers to see your new email content if they happen to miss your email. Google and other search engines will also index the archive of newsletter content on your website, which may also increase the quantity of organic search traffic that you receive. If you own a physical store or have any other kind of retail location, ask every customer if they want to sign-up for your email list at checkout. You can ask each customer something like “Would you like to sign-up for our mailing list and periodically get coupons in your email?” If the customer says yes, have them write down their email address on a sign-up sheet on a clip-board. At the end of the day, add every customer that gave you their email address to your mailing list. Add a link to your email signature and your employees’ email signatures that contain a call-to-action and a link to sign-up for your mailing list. 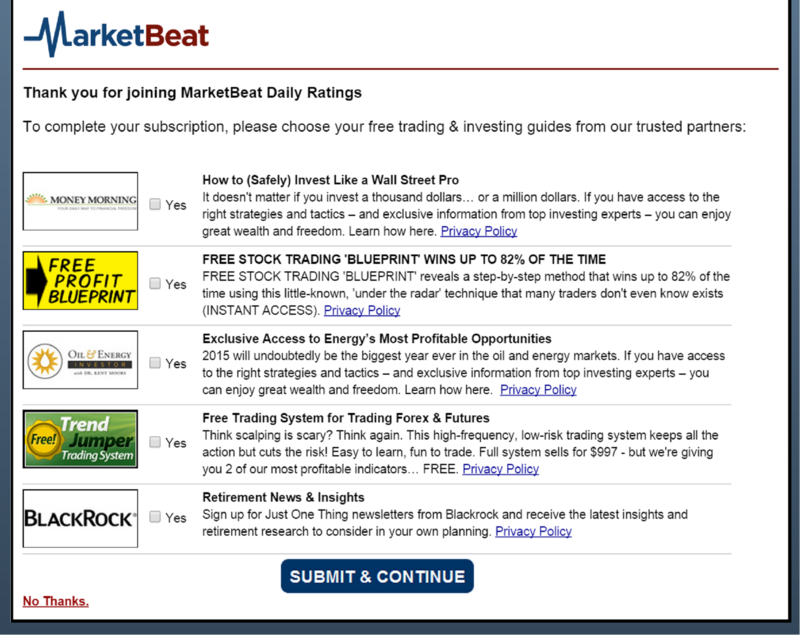 Want the latest news and updates about MarketBeat? Click Here to Sign-Up for Our Newsletter. Find something of high perceived value that you can use as a giveaway or a contest prize, like an iPad or an iPhone. Require everyone participating in the contest to sign-up for your mailing list in order to enter the contest. Promote the contest through your personal and company social media channels, as well as any other marketing channels that you might have available. Remember to add social sharing buttons to the contest page on your website to make it easily shareable. Develop a high-value lead magnet or another offer, such as an e-book or free report, and share it on all of your available social media channels. Require that users enter their email address in order to access the lead magnet or other offer item. Make sure to use every social media channel that you have available, including Facebook, Twitter, LinkedIn, Instagram, Pinterest, Tumblr and any other social media profiles that you have setup. Share the offer through both your personal social media accounts and any profiles that you have setup for your business. Share the offer multiple times over the course of a few weeks for maximum exposure. If you or your company has a YouTube Channel, add calls-to-action and hyperlinks in your videos to subscribe to your mailing list. Use annotations and your video description to include hyperlinks back to a landing page on your website where users can opt-in to your mailing list or respond to another offer. To learn how to create annotations in your YouTube videos, HubSpot has put together a quick guide that demonstrates this process located at http://blog.hubspot.com/marketing/how-to-annotate-youtube-video. If you have money to invest in your list building campaign, you can use Google AdWords to drive traffic to a landing page where users can enter their email address in exchange for a lead magnet or another offer. Make sure to use the conversion tracking pixel that Google providers in order to identify which keywords and ads are driving the most opt-ins. After your campaign has been running a while, you can use Google’s cost-per-action (CPA) bidding to optimize for email sign-ups. AdWords also has an extension that allows advertisers to place an opt-in form directly in search results, but that feature is currently only available to a select group of publishers. While creating a Google AdWords campaign is beyond the scope of this book, I recommend reading the Ultimate Guide to Google AdWords by Perry Marshall and Mike Rhodes if you want to learn how to create a Google AdWords campaign. Presenting at a Trade Show? If your organization is ever presenting at a trade show, you have a prime opportunity to gather new email sign-ups. Run a giveaway and offer a highly desirable prize. New electronic gadgets, such as iPads, Kindles and video game systems work great as prizes. Allow attendees to enter your drawing by dropping their business card into a fishbowl. You’ll need to make it clear that contest participants are signing up for your mailing list. At the end of the conference, pick a winner and add the participants to your mailing list. Send a welcome email to every new mailing list member that came from the trade show. Your welcome email should remind them about the contest, why they have been added to your mailing list and provide information about your products and services. You should also include an opt-out link in your welcome email so that anyone that doesn’t want to receive email from you can easily opt-out. If your business makes use of print marketing material, add a QR code that users can easily scan with on their phones. Use the QR code to redirect users to a mobile-friendly landing page on your website where you can ask them to opt-in to your mailing list. You can easily create a QR code using any number of websites that offer free QR code generators, such as www.qr-code-generator.com. Also include a short URL that redirects to your mobile-friendly landing page directly below the QR code. Not everyone has a QR code scanner on their phone and it may be easier for them to simply type in a URL into their smartphone’s web browser. If your organization has a Facebook business page setup, you can add a call-to-action button on the header of your Facebook page to attract email sign-ups. In order to create a call-to-action button on your organization’s Facebook page, navigate to your page and click the “Create Call to Action” button in the header of your page. You can choose between a number of button texts including book now, contact us, use app, play game, shop now, sign-up and watch video. I recommend using “sign-up” as your button text. You will also be asked to provide a URL where users can sign-up for your mailing list. The URL that you provide should be a landing page that provides an introduction to your mailing list and provides a sign-up form so that users can easily sign-up for your list. While the bulk of your email opt-ins will likely come from your website, there are many other ways to grow your mailing list independently of your website. 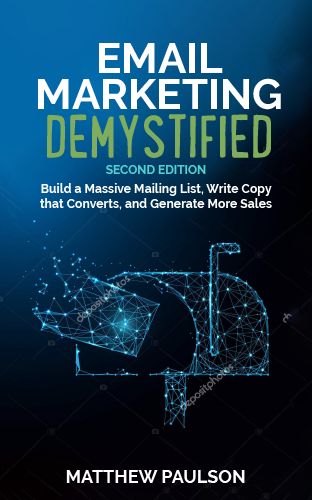 While not every strategy listed in this chapter will be appropriate for every organization, consider which of the 14 strategies presented in this chapter you can use to grow your mailing list. Whether you want to leverage social media, do paid advertising campaigns or run a contest, there are always more ways to accelerate your list growth beyond getting opt-ins on your website. Make a list of 100 potential partners that you can do email swaps with. Leverage your social media profiles to build your mailing list and promote your existing email content. Determine whether paid list-building strategies, including co-registration advertising, Google AdWords and email list rentals are appropriate for your mailing list. Add social sharing and “forward to a friend” buttons to your email content. Make a sharable archive of past email content on your website. Consider what other ways that you can grow your list independently of opt-ins from your website. Thank you o much for this amazing information!